Timber bollards are a common, yet commonly overlooked, feature of streetscapes and community spaces. This Guide details the considerations for better bollard design and specification so that common poor construction and inferior product substitution can be avoided. 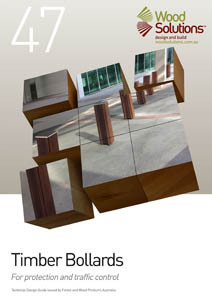 Written by specialists in the field, this Guide, provides extensive information on the design, timber selection, installation, finishing and maintenance of bollards in a range of typical locations. The selection of appropriately durable timber species and grade is particularly important – not only for the weather-exposed portion of bollards, but also that buried in-ground. The 30+ page Guide features illustrations, photographs, drawings and case studies to create a practical, hands-on resource that will be a valuable addition to the library of landscaping practitioners, as well as a teaching tool for TAFEs and other institutions.